Where is the world of corporate leadership going? 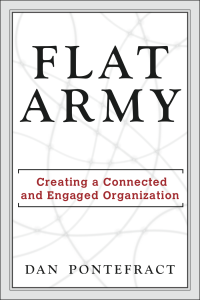 It is anyone’s guess, but if I had to bet, it would be in the direction of the “Flat Army.” Written by my friend, Dan Pontefract, this book gives us not only a model of how we could better run our companies, but also how to get there. Everyone is asking, “Why are our employees so disengaged?” Dan tells you straight up why. He takes a bold approach: Why are your employees so disconnected? Why are they not engaged? Then he tells you why, without pulling any punches. I was amazed at the research he put into this book. Not only are there stats from a ton of studies, but he also pulls out quotes from many books and adds in examples of his own that kept me reading. His stories are top notch examples – for good or bad – of the principles he discusses. I found myself attracted to the next story and point he would make, and then loathing to put down the book for an interruption. This book gives you the WHY behind where we are today – the hierarchical and command/control nightmare – and then gives you a way to escape from the dark side. Dan’s personal story of using a cell phone in a grocery store is one I will always remember. He saw a sign for the employees that told them that the use of cell phones was prohibited while at work and that breaking the rule could mean they are fired. Then he asked an employee to help him find out if a product was gluten free or not. The employee, knowing the consequences, hesitantly but willingly, took out his cell phone and looked up the information. Dan later wrote to the manager thanking him for such great customer service. Later, the sign disappeared. To me it was an incredible story of corporate rules prohibiting the ability for employees to be empowered (and thus engaged) in their work and servicing the customer to the best of their ability. Basically, he points out that too often the company gets in the way of the employee doing the right and best thing for the customer. There are few books that tackle this issue head on. Thank you, Dan, for not only being bold, but showing all businesses how to create an engaged organization. The world needs more Dans. And more Flat Armies.